Cottontails Baby: Have you met Ernest? 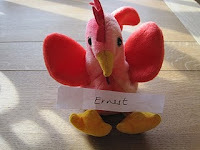 I just have to tell you about a lovely little rooster who is making his way around 'blogland' at the moment. If you would like Ernest to come and stay with you, all you have to do is put in a request to his latest host family, names are usually pulled out of the hat at the end of the week I think. I am desperate for him to come and stay with me - I want to introduce him to Moulin Roty's Felicie hen, I think we might have a romance on our hands when they meet! Humphrey is a bit suspicious of all this excitement over a chicken, and has asked me to finish the post on with a rabbit picture. So, especially for Humphrey, here Felicie's bunny friend, Sylvain. So glad you have hopped over to visit with me and the bunnies! I love your charming store and Humphrey is such a doll himself! I'm now following, so I'll be back to visit often! Oh Charlotte I'm laughing out loud ! I do hope he comes to you soon - it's been such fun & I'm glad the idea seems to be working well ! Enjoy Silent Witness - I love it too ! You were right, there's Amedee and actually two Nini's and one baby Nini. We also have two Sylvains, but only one is in the photo. The other one must have been upstairs with Barnabe the donkey! So Jeanne will be there around Easter time? I might order two for the girls instead of Easter eggs. Are you taking orders yet? Have been following Ernest's travels with interest.He seems to be having a great time! He wouldn't want to stay at the Boo household...once Bella got hold of him...well...it doesn't bear thinking about!I wonder where he's off to next? i just found you through shell's blog, what sweetness you have here...nose nudges to your bunny from us! They are VERY sweet, but Humphrey is the cutest! Well, Audrey is a nice little floppy bunny who is also "making the rounds" .. right now she is at Life at the Zoo and is soon headed to The Bunny Lounge and then, I think, to Eye of the Needle ... she was with us last summer! Love Ernest! and the gap year is such a great idea! I am afriad to adopt him in case I become too attached and never let him leave! How are you Charlotte? I have been press ganged into seeing Avatar as someone whose opinion I trust raved about it so much, she has seen it twice! I am still a bit sniffy about it to be honest, as on the face of it , it doesen't seem to be remotely my cup of tea! As we share similar filmic taste I thought I would ask if you had a view!